How many of us dream of that next big family vacation? 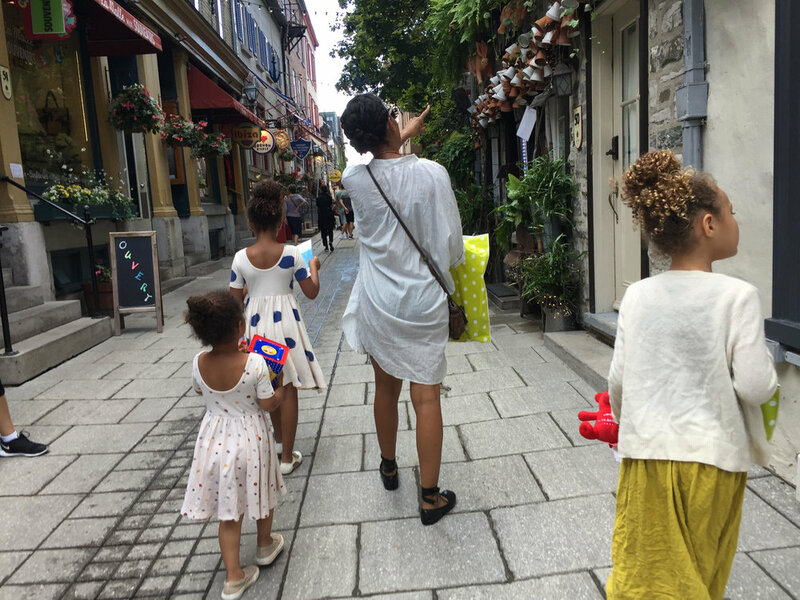 For Joy Chasers blogger and Fashion Mamas New York member Naima Petz, touring the world with her entire fam is a lifestyle, but that wasn't always her plan. She and her husband "had it all": Three gorgeous daughters, the dream house, two cars, and a dog. A self-professed collector "of all things," Petz had a pivotal realization that despite her inspiring home filled with art, antiques, vintage clothing, and impressive shoe collections, she and her family were not truly living their best lives. That's why she decided to leave her cushioned life behind in order to travel around the globe and provide her children with experiences they wouldn't otherwise get in a classroom. It wasn't simply about having the opportunity to jet-set on a whim: Petz's family are firm believers of "worldschooling," a way of life that combines travel and education. Below, keep reading to find out what it really means to worldschool, what she and her family have learned from their global adventures, her top travel dos and don'ts, how she manages to find kid-friendly things to do everywhere, and what's next on her whirlwind itinerary. What are your kids' names and ages? Amélie Valentina, 8; Indiana Solis, 6; and Lucienne Luna, 4. When was the first time you heard about "worldschooling", and how did you get into it? We kind of fell into home educating. Our original plan had been to stay in each place long enough to send the girls to alternative schools (they had attended Montessori and Reggio preschools before we set out). We decided to keep Amélie home when she was five because she has an off birthday, and would have been a young kindergartener. That first year was so successful for both her and Indi (and me!) that we just never looked back. By our second year, I realized that the girls were far more engaged when left to follow their own interests and learn organically. We began putting a much heavier emphasis on providing experiences and opportunities, and sprinkling in math/reading/writing. Much to my surprise, I found us mostly ‘unschooling’. To be honest, I had never fully believed that it could be successful until I lived it. In all fairness, we do still follow an incredible math curriculum, and I am a stickler about penmanship. Eventually, as I would search for local homeschool group meet ups in locations we would be traveling to, I came across the term "worldschooling." Of course, it struck me that that was exactly what we were doing. It’s been a lifesaver to have that label because it’s become so much easier to find people who get it. We’re in a worldschoolers pen pal group, we have another where we practice Spanish and German and the girls help others practice English, and we get great real time advice about practically any destination on the planet. It’s an amazing community. "At its heart, the world is a good place. People everywhere are basically the same and want the same things for themselves and their families." Tell us about your career/life journey: What inspired you to lead a minimalist life focused on traveling around the world? I come from a lifestyle marketing background, and I was the opposite of a minimalist. I loved collecting antique pieces and vintage clothes, and was proud of my impressive shoe wardrobe. And makeup. And hair products. And books. I was a collector of all the things. My husband, Aaron, comes from an advertising and fine art background, and his art and sneaker collections were equally impressive. Match made in heaven, or a quaint arts district with great galleries and vintage shops. When I became a mom, my perspective began to shift. Our home was quickly inundated with clothes, toys, and gear from well-meaning family and friends; most of which we didn’t need. Grandparents from both sides had a quiet competition going to see who could gift the biggest teddy bear. It was intense, and hilarious. Meanwhile, we had moved into our "dream home", complete with two cars and a dog. One day, while trying in vain to remove nail polish from one of our THREE couches, my husband and I looked at each other and were struck with how absurd it was to have all that space and all those things. Sure, we loved hosting guests and entertaining, but the girls and Frida (our Bernese Mountain dog) literally followed us from room to room, and we all basically lived in the same three spaces. It was painfully obvious that in this respect, we were failing at living intentionally. We quickly pinpointed the things we wanted as the cornerstones of our family life — connection with each other and others, and respect and appreciation for the earth and her inhabitants — and set out to realign our life with our intentions. Travel, specifically traveling deep, was the clear path to create the life we really wanted. When you do buy things, you tend to be very conscious — so what are your current favorite brands and/or products and why? Living out of a backpack (much of the time) has given us the opportunity to be very mindful about what we own. My husband always reminds the girls that "every ounce counts." My bag always has items from TWO New York, Amae Co, Lisa Marie Fernandez, Myrah Peñaloza, and Dr. Alkaitis skin food. Dr. Alkaitis is the one product I will order anywhere in the world for myself, and I live in my playsuit from Myrah Peñaloza. The girls rock Alice + Ames, Bobo Choses, Black Crane, and Maisie Loves Nory. Their curls can be totally untamed, but stick a Maisie Loves Nory bow on and they instantly look like their mother hasn’t given up. Our must have travel gear are miFold portable carseats, and old school iPod shuffles so the kids can jam out, or listen to Sparkle Stories during down time. What have been a few of the most meaningful/memorable lessons you've learned while traveling? My mama always said, "Wherever you go, there you are." This travel life is not a vacation, and nothing (least of all reality) is being escaped. Far from it. It forces you to face not only the world, but yourself. I had a traumatic pregnancy and birth with Indi, and suffered from PPD and PTSD for far too long. For a long time I hid from myself because it was just too much. Meeting so many women from all walks of life and seeing my feelings mirrored in their faces, and hearing my heart in their stories opened me up enough to let the grief out. It’s given me a much greater understanding of myself, and such deep appreciation for mothers and those who mother. No matter how far or how long we go, we are all struck by the kindness of people. At its heart, the world is a good place. People everywhere are basically the same and want the same things for themselves and their families. We’ve had a few instances when we’ve been caught off guard, expecting people to react unkindly. Nearly each instance has ended in magic. From an elderly couple coming and holding our crying baby so we can finish our meal, or a busy mama with babe in arms going out of her way in the freezing cold to help the obviously lost foreigners find our way to our hotel; we are all so connected. We’ve also had the honor of being on the flip side. We’ve befriended refugees, and others living in comparatively challenging situations. Not only have we had the opportunity to bestow a little kindness of our own, but we’ve witnessed first hand the resilience, bravery, and love of the human spirit. It’s been a beautiful, humbling perspective of humankind rising, always rising. "We quickly pinpointed the things we wanted as the cornerstones of our family life — connection with each other and others, and respect and appreciation for the earth and her inhabitants — and set out to realign our life with our intentions." How do you manage to find "kid-friendly" things to do in any city? Honestly, the internet usually can’t be beat for crowd sourcing ideas. And, the mama connection is so strong! There are mamas all over the world, many whom I’ve never even met in real life, that I have spent countless hours DMing back and forth on Instagram. They’ve given me ideas on everything from where to find chocolate making classes for kids to the contact of an English speaking pediatric dentist. It’s an invaluable resource that we tap into often. And if all else fails, follow the kids. Our girls can smell a playground from a mile away. See also: Ice cream shops and toy stores. We’ve always gotten great ideas for activities from other mamas on a playground run. What are your top tricks for getting the family packed up in a hurry? Don’t panic. Kids sense it, and manage to convince you to allow an extra stuffed animal against your better judgement. Really though, less is more, and teamwork. We start by having the kids lay out all their stuff and consider what they are ready to pass along. Meanwhile, I roll everyones clothes into their color-coded travel cube. I keep an extra travel cube in my carry on with a spare outfit for everyone, just in case. We also have a travel cube used only for pajamas so we don’t have to go rummaging if we arrive at our destination late and exhausted. Aaron makes sure any tech is charged and stored (he loves meticulously wrapping cords and playing Tetris with chargers and gear, ha!). Hair is styled the night before we head out (curly girl problems), and everyone’s clothes and shoes are laid out. Indi sometimes likes to sleep in her clothes because she’s worried she’ll be late for early departures. In your experience, what are the top things people DO and DON'T need to travel "properly"? Top DO is to have chill, all the chill. Being able to let go and flow will make every travel situation smoother. We also like to have key phrases in the language spoken at our next destination. If your kids are apprehensive, or you’re heading out for a big chunk of time, we always have ‘anchor items’. They are things that are family rituals, or keep us in rhythm and connected. Some of ours are sparkler number candles for each kids next birthday, a travel essential oil diffuser so every space smells like ‘home’, and Unicornius, the stuffed unicorn I made Indi several years ago. And a sense of humor is a must. It can be so tempting to get caught up in emotions and minutiae, and it’s so important to learn to laugh it off and hit the reset button. Our number one DON’T is money. We get daily messages about how people wish they could travel, but they don’t have the funds. So much depends firstly on where you travel; that NYC budget can go awfully far in most of the world. It also depends on how you travel. We’ve got friends that have been living in Thailand as a family of four for about $15USD per day. Total. They live very simply, but it works for them. There are also so many ways to finance your travels. A friend of ours is a traveling chef, plenty of people teach English around the world or remotely, many of my travel friends are in the yoga/wellness business; the options are endless. The other big DON’T is "stuff." Every little thing seems so important from the outset, but hindsight usually proves that many things were unnecessary. Most things can be reasonably replaced anywhere, and if they can’t be, you probably didn’t really need them anyway. Before I had a good system with packing, my plan was always to lay out everything I thought we needed, then take away half. Sleep on it for a night, then take away another half. We still usually had stuff to unload along the way. Where are you heading to next? What makes you excited about this destination? This next year is a really exciting one for us. We will spend a few months in México, then head to South Africa, Greece, Germany, Russia, China, and land in South East Asia for the following year. Aaron and I have been called to Tulúm for a couple of years now, and it’s finally happening. This trip will be to scope out the possibility of making it our next home base. Every year we visit an ashram in Germany, so that's always a homecoming for us. But the spot I’m most looking forward to is Russia. Amélie and Indi were reading a National Geographic featuring the world’s most luxurious train rides. That got us talking, and for some reason they were really stoked hearing about the Trans-Siberian/Trans-Mongolian train. They’re fully aware that it will NOT be a luxury train ride, but we are all waiting in anticipation for that leg of our journey. Plus, Saint Petersburg is a bucket list destination for me. It’s held so much fascination for me since I was a little girl. This year is seriously a dream. Keep up with Naima Petz's global adventures at @joychasers.